Ai Fukuhara and Chiang Hung-Chieh were married earlier this year in Chinese Taipei but a second ceremony was recently held in Japan. 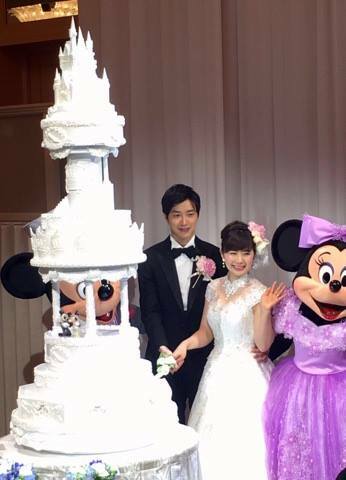 Fukuhara has once again walked down the aisle, this time at the Tokyo Disney Resort. Ai Fukuhara looked the part of a Disney Princess, her dress taking inspiration from none other than Cinderella, while Chiang Hung-Chieh took on the role of Prince Charming. Sporting stars attending the occasion included Jun Mizutani, Japanese swimmer Ryosuke Irie and sumo wrestler Hakuho Sho. However, these stars were outshone by the famous couple of Mickey and Minnie Mouse. The Disney royalty were there to assist the bride and groom with the cutting of the cake which featured a Disney castle. No news as yet whether a second honeymoon is also planned, but all the fans are wishing the couple a happy ever after.